« The bigger the group, the better. For Nathan, anyway. 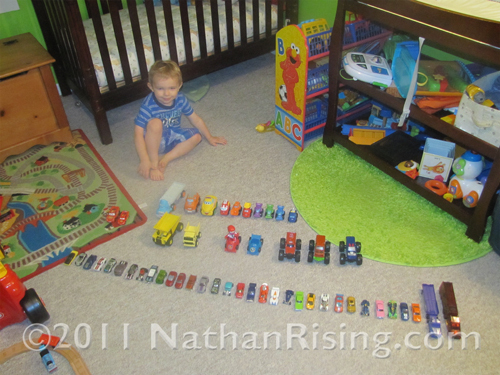 Nathan loves when Paul or I line up his Hot Wheels and toy trucks. In fact, he is completely fascinated by it, and he will run in circles around the toys, enthusiastically clapping his hands. And the funniest part is that he won’t mess them up immediately. He actually leaves them in their neat little rows for quite a while. This entry was posted by Jen on September 9, 2011 at 3:34 pm, and is filed under All About Nathan. Follow any responses to this post through RSS 2.0.You can skip to the end and leave a response. Pinging is currently not allowed.